This bake was one half of Peter Reinhart's recipe from BBA. I used 50g of sweet levain and 50g yeast water levain. The dough more than doubled in an hour in the bulk ferment and even half the recipe tested the capacity of my Lodge DO. 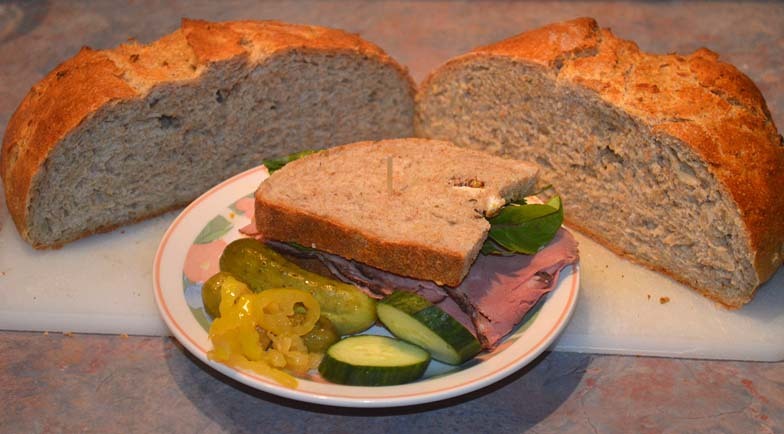 This makes a wonderful sandwich bread -- piled high with Montreal smoked meat and grainy mustard. YUMMM! I let this get happy for about 4 hours and then began the mix. I mixed, rested for 20 minutes, then kneaded for 6 minutes, then into an oiled bowl to bulk ferment. In an hour this cough had more than doubled, so degas, stretch and fold and pre-shape. After 10 minutes I shaped a boule and proofed in a linen lined wire mesh colander suspended in a mixing bowl. After 30 minutes proofing the oven went on at 400F. After an hour of proofing I scored and baked in the hot cast DO covered for 12 minutes, then uncovered for another 24 minutes convection turning every 4 minutes. Happy Baking in the New Year Ski - and skiing too! Happy New Year to you and Lucy and your family! I bought 110g of Montreal smoked meat at the deli yesterday and ended up using all of it on one sandwich. Just the way it should be and back to the deli today. Nice looking deli rye. Perfect for a sandwich after a nice ski run. So what is Montreal smoked meat exactly? Montreal smoked meat is made with brisket, while pastrami is more commonly made with the navel/plate cut. While some Montreal smoked meat is brine-cured like corned beef, with spices applied later, many smoked meat establishments prefer dry-curing directly with salt and spices. ANY smoked meat would taste great on this bread! That's the bread I grew up on. i think its of the best breads in the world with absolutely nothing on it as well as with all them smoked/cured meats you speak of. Ski you should convert your white starter to a rye sour and try this recipe. Use same exact formula and just rearrange the flours so the rye sour can be the preferment. I'm certain you'd like it. Interesting that you use milk. Must make it softer than its partner made with water. If you grew up on it and it looks right to you, that is a big compliment indeed. Many thanks! The crumb is soft and moist and I would almost call it shredable as both slices I cut for today's pastrami tore down the middle as I cut using a new sharp Henckels bread knife. I have made this previously with a rye starter and will agree the rye starter adds more flavour. I will convert both my sweet and YW levains to rye for my next bake of this loaf. My neighbours and I have enjoyed this one so much I will likely bake another early next year! Looks like a wonderful bread Ian! I am going to try a version of this, but will not be able to find first clear nor white rye. Are rye chops just rye flakes chopped up? If so I am good to go on this ingredient, but I will have to find a different beer. Other than that, I will do a half version of this formula. It looks wonderful and must taste great! Rye chops are chopped rye berries. If you can get King Arthur Flour to deliver to you then you can get the First Clear and White Rye if desired. Okay next bake . . . The list keeps getting longer, but I will try this formula with no milk -- sometime next year. LOL! Every time I bake something I get more great ideas from great bakers like you. I love this site!